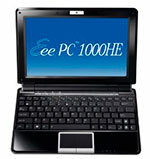 Get it while it’s hot – the new 10″ Asus Eee PC 1000HE is actually showing up in stock at Amazon.com. This is for the 1000HE (EPC1000HE-BLK005X) (Black) edition. It’s listed with the $25 dollar discount – $374 (USD). The blue model, 1000HE (EPC1000HE-BLU002X), is still showing 2-4 weeks. Between the higher capacity 8700-mAh battery and ASUS’ Super Hybrid Engine claims over 9 hours of battery life, however a more realistic/normal usage would probably be over 7 hours, which is what LAPTOP Magazine got in their battery tests. This maybe the first time they’ve been in stock at Amazon – they were in stock briefly at a few other places last week, however I’ve talked to a few people who have already had them ship from Amazon (the first batch probably sold quick which is what led to the 2-3 weeks shipping dates). There’s been some talk and some images popping up about a slimmer than usual Acer Aspire One. Macles had a few photos, along with speculation that it would be packing a Solid State Drive (SSD) or similar flash memory-based storage in order to keep the size of the profile down, as well as moving some of the ports around. An anonymous reader of NetbookNews.de has sent them quite a bit of information along with photos that are clearly not publicity or marketing stills – they show the machine in use, as well as closeups of the ports. They claim it’s got a normal Intel Atom N270 (1.6GHz) CPU under the hood, and is based on the current 945GME chipset (ICH7). Just as important – they claim it’s got a 160GB HDD, which you would think might add to the bulk, however if the measurements they gave NetbookNews.de are accurate, namely the thickness of 0.9 inches / 24 mm, then it is indeed quite a bit slimmer than the 10″ Acer Aspire Ones that are currently shipping. The keyboard layout resembles the current 10.1-inch Acer Aspire One, although the Synaptics touchpad looks larger. In one of the photos you can clearly see the SD Expansion slot, something that was dropped between the 10″ and 8.9″ Acer Aspire One. We’ve known about the MSI X-Slim X320 since CES 2009, although not too much, at least as far as pricing and release dates. We also know that MSI has been showing off the X-Slim X340 and X600 ahead of next week’s CeBIT 2009 in Germany. What we didn’t know before now, and this is information from DigiTimes, is that Asustek would also be showing off a similar laptop/notebook. All four devices are based on Intel’s Consumer Ultra Low Voltage (CULV) platform. The CULV platform is designed for ultra-thin and ultra-portable devices. Apparently, at least in the case of MSI, the X340 and X600 and maybe the X320 fit into Intel’s plans for CULV, as far as breaking the CULV platform out into three distinct segments. As far as the X320, it’s been listed as having an Atom, and Intel’s lowest tier of the CULV platform is centered around a Celeron. It could be that the Atom takes the place of that, however, the Celeron and Core 2 Solo and Core 2 Duo CPUs available for the CULV are all compatible with the same CPU socket, whereas the Atom has a different architecture. However, DigiTimes mentions that Intel has listed around 20 different configurations, and that Hewlett-Packard (HP) will also be joining Asustek and MSI in the CULV market. The article (and DigiTimes’ sources) make a good argument that the CULV platform may end up having an impact on the netbook market, since the 10-inch netbook market is quickly heading towards very low prices (the Asus Eee PC 1000HE and 10.1-inch Acer Aspire One come to mind with their sub-$400 prices). For those manufacturers that want to compete with ultraportable laptops, but don’t want to get into a race to the bottom with the 10″ netbooks, the CULV platform makes a lot of sense. LAPTOP Magazine has reviewed the 10.2-inch Asus N10J-A2, which is Asustek’s high-end netbook. It’s actually really pushing the definition of a netbook, given the features and the price (the reviewed model is $799 and Amazon.com has it for $763). It’s still powered by Intel’s Atom CPU, but there are two graphics chipsets that exist on the N10J-A2. Some N10s may not have both. One is the built-in GMA 950 from Intel that is used to conserve battery life. It shares its memory with the system memory. The other is an NVIDIA GeForce 9300M GS with 256MB of dedicated memory. No matter which graphics chipset you have toggled for use, they were still able to get over 4 hours of battery life. It also features Express Gate which is a Linux-based “Instant-On” OS that allows you to quickly jump into email or browsing the web without having to launch all of the way into Windows. Earlier this month Ars Technica published the first part of their “State of the Netbook” series. The first part covered around 15-20 years prior to 2008/2009. Yesterday they published part two, aptly named “The State of the Netbook, Part II: The Inevitable Eeeruption” which covers Asustek kick-starting things with their Asus Eee PC line as well the One Laptop Per Child (OLPC) and Classmate projects, which spurred Asustek into action, along with the Nanobook concepts and Intel’s platforms. The HP 2133 was mentioned for its role in getting VIA into the game. Is it possible that, after all this sound and fury, the netbook trend may yet turn out to be a tale told by an idiot? It seems unlikely. This attempt has escalated into a Greek epic of coordinated technological and economic effort by a huge variety of players. From dedicated processors and chipsets from multiple vendors, to cheap LCD screens and memory to tiny hard disks (and SSDs) capacious and fast enough to store and deliver the media users demand, the technology has arrived, and it is being delivered in a dedicated form, engineered for this wave of devices. This is finally it. Part III will cover the Intel Atom and how it’s both helped and hurt the PC market in general.